Today’s students, like all of us, will learn more outside the classroom than inside it. 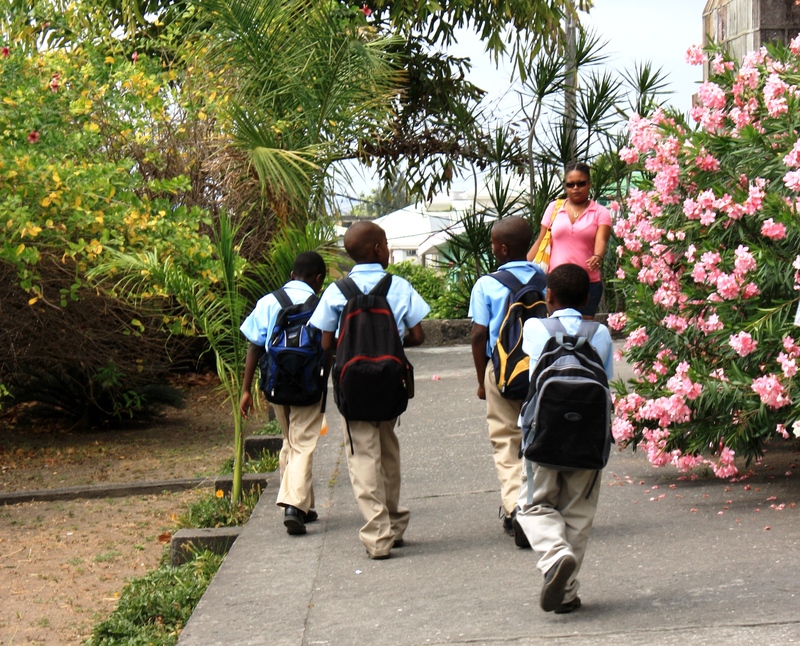 I photographed these school children in Dominica, March 2010. It bothers me that formal education is becoming a status symbol, a commodity to be rated and sold as a means of achieving society’s wealth and adulation. Never mind that the world is kept running largely by people who are unable to go to the local community college, let alone Harvard. In the mutual admiration society that constitutes much of academia, this kind of reality doesn’t intrude until one’s plumbing goes awry, or the sanitation workers go on strike. I’m guessing we all know many people who never got a college degree (and maybe never even a high school diploma) who were sources of unfailing wisdom, strength, humor, achievement and support. I feel safe in assuming that many of these people were of our parents’ generation, and went to high school during a time when there was no cottage industry that existed purely to increase SAT scores. They made their way in the world without benefit of AP courses or programs for the gifted, before anyone ever thought to talk about self-esteem. Knowledge does not equal wisdom, and increasingly, formal education does not necessarily equal either wisdom or knowledge. I’m not knocking education; it’s a wonderful thing. Sometimes you can even get it from a school or a university. But we learn the most practical and lasting lessons from life outside the classroom, through the person-to-person exchanges we have with each other, especially the ones that don’t involve grades, money, or other not-so-hidden agendas. None of us needed the Ivy League to teach us to cook, pay bills, cheer others on, fix what breaks or volunteer to lend a hand where needed. We learned those things by watching others, and most of the people we watched don’t have any impressive initials after their names. Today, I hope you will remember fondly those lessons you learned from people who were teachers in the truest sense of the word. They may never be honored with formal titles or pomp and circumstance. But whatever good we have in our lives is directly connected to their unheralded faithfulness in showing up and keeping on. Thank you Patricia. I’ve had the benefit of knowing some truly amazing achievers who never went to college. Good morning, Julia! As with yesterday’s blog, I’m glad that I listen to the wisdom of uneducated people, because I learn so much more. You are right; while some are in school diving into subjects, others are spending that same time doing something else, but we’d be ignorant to think that they weren’t learning. My mother was the first from her family to go to college, while my dad’s parents were both college educated. I’ve learned plenty from both sides! Yes Susan, I admire people who have lots of formal education, but I don’t think college and graduate school are for everyone. People have different gifts and some are able to do remarkable things without a degree. I worry that so many of today’s young people feel that they MUST go to college even if they are going to struggle there, or if it means going into debt to qualify for relatively low-paying jobs. Then I know others who seem to feel embarrassed about going to community colleges, when there are some really good ones in every place we have lived. I just hate to see college becoming such a social status issue. Hi Raynard, I think the library is a free university for all who care to use it. Ray Bradbury used to say that he graduated from the public library, because he couldn’t afford to go to college. He became one of the most successful writers in American history, and his works are now required reading in many high school literature classes. I think sabbaticals are always a great idea — from whatever we do — since we all need to recharge our batteries now and then. Thanks for your encouragement — hope that you have a great week! Thankfully I read the last few weeks of the blog. I’m so pleased that Matt is doing well and that Jeff continues his treatment. What you say always blesses me. Today’s message is particularly significant because I could not agree more. My prayer for Matt is that he will find something meaningful to do, whether it is in a formal educational setting or not. May he always find wise people to help him make wise choices. May we all find that. May we be those wise people. Thank you so much, Patricia. We need and appreciate the prayers. I am grateful you are here, and that you took the time to read up on how we are doing. I hope you are doing well! I agree whole-heartedly with your post. A God given gift and the good common sense to use it goes a long way, whether that gift requires an advanced degree or a GED. Alan, one of the most effective teachers I ever had was my lead professor in graduate school. She made it a point to hold a significant number of our classes OUTSIDE the classroom in the “real world” of school libraries, where we saw the difference between theory and practice, and what made those differences necessary. The “real world” often bears little resemblance to the classrooms where we study it from a theoretical viewpoint. I never saw Jaws but I love that quote. There’s no teacher like experience, and until we have that, the closest we can come is watching others who have that experience. I appreciate being reminded of the good side of the NEA. Most of the teachers I have known are not all that fond of them. I guess being forced to pay union dues will do that. My impression of the NEA stems mainly from our years in Northern California, where each year, whichever local school district’s teachers had the lowest pay would strike until they got a contract that made them the highest paid in the region, and the following year the district that was pushed to the bottom would do the same. In this way the teacher’s salaries were on a continual upward climb even as the educational quality (as measured by several factors such as dropout rates, truancy, etc.) would often go down. Teaching is a very, very difficult profession and I suppose unions are necessary, but I hated reading in the local papers about some of the thug-like behaviors sometimes hurled at the substitutes who worked during those strikes so that children would not be left alone in classrooms or at home because the teachers were striking, holding signs saying “INVEST IN CHILDREN” while they were leaving those children without teachers in the classrooms so they could get pay hikes for themselves. Julia, I had yet another tiresome discussion with someone last Sunday who has judged me for over a decade for not finishing college. I forgave them years ago, yet I felt tested once again. I am in my mid 30’s now and finally know what I would want to get a degree in. I had ZERO clue at 18 what I wanted to “be” so I got my AA, worked in ministry, had kids and was blessed to be able to stay at home with my two boys for the past 6 years, which has been my favorite, most challenging, most rewarding job ever! Jenelle, some of our greatest writers never went to college (see my earlier comment about the incomparable Ray Bradbury). I think I appreciated graduate school so much more at the age of 37 than I would have at 22. But I still think real-world experience (particularly that which comes from rearing children and managing a home and family) is far too undervalued. Resist the pressure to go to school if you know you don’t need it. For some added morale, read this wonderful poem by Marge Piercy. I wish you the best at whatever path you choose to pursue, and if you choose it for the right reasons (and not because someone else thinks you need to impress people with a degree) I know you will find success! Thanks for being here. You’re welcome. I’m so happy you liked it! Here! Here! One of the reasons I love homeschooling my children is that I can teach them non-academics, such as cooking, balancing a checkbook, and how to treat others. If you ask me to rank the reasons I homeschool, the fact that homeschoolers rank high in academics would be one of the last items on the list. Thank you Barb! It’s so easy to fall into the trap of thinking “one size fits all,” particularly when it comes to education. I think another advantage of homeschooling is that it can be more highly individualized than public education. There are advantages to both (I went to public schools, as did my children) but I can’t argue with the results of my friends’ efforts at homeschooling. I too feel sad for the young people who are starting life with such a huge amount of debt. When I went to college, tuition was not even a tenth of what it is now, even at a private college. And graduate school at UH was unbelievably affordable. I find the costs of college nowadays staggering. Jeff and I are thankful that Drew was on full scholarship throughout his 24 years of school. I know we would not have supported his going into debt for those years. Hi Julia, the third paragraph in your post made me giggle today. We actually spent the day with a grade 2 educator that teaches at a french emersion school. They’re having labour conflict with the sitting provincial government. With the school year fast approaching, it’s hard to say what will happen. The conservatives (as we call them, equal to your Republicans) want to privatize the education system. Selling off education and school property to the highest bidder (i.e.. Walmart, Petro Canada). I think it’s madness. That does sound pretty horrifying. Unfortunately, public schools here started selling out long ago by allowing corporations to place vending machines full of junk foods on school campuses, in return for money and other perks. When I was in school we would never have been allowed to be drinking cokes and eating candy bars between classes. And they wonder why kids are obese. There is a movement now to limit what the vending machines sell, and I say it’s about time. But I don’t know if it will succeed, because it’s all about money, money, money. My friend Peggy (a retired teacher) just came back from volunteer teaching in Africa. She was in a village that didn’t have much money, and she said the classrooms had dirt floors and no air conditioning or any of the things we think are essential. But her impression was that the students are actually ahead of many of the students in U.S. classrooms, especially in math comprehension. She was impressed by their efforts and focus. I can totally believe that your father had better math skills than many of today’s graduates. I think today’s college diploma is comparable to what a high school diploma was in our parents’ day. It’s sad and seems to be getting worse, not better. There’s a really good and chilling young adult novel called Feed by M. T. Anderson. It takes place in a future where everything is controlled by corporations and the media. It’s really thought-provoking to realize how much our lives are influenced by the 24/7 messages bombarding us from almost every direction. There was debate about vending machines here too. That’s why I can’t believe they’re debating such a change. I popped over to the link on the book ‘Feed’. That sounds really interesting and not all that unbelievable. Alys and I just went to a Tom Cruise movie tonight that’s set in the future and humanity is battling an invasion. I’m hoping I’m long gone, LOL. BTW while I don’t agree with commercial ownership of the school system, I do think bureaucratic government types could take a lesson or two in fiscal responsibility from businesses, who don’t survive if they don’t manage assets well. I have some real horror stories from when I was working in state government positions, regarding the continual waste of money without regard to where it comes from. In those years I learned that working for the government was on a different planet from working in the private sector. There’s a fine line between having money as the bottom line that controls everything, and disregarding the need to be cautious with the taxpayers’ hard-earned money. I feel teaching is the least acknowledged service. However the positive response we get from the students, may be after decades, is our greatest reward. You are right – the greatest lessons learned are not necessarily from the teachers. We don’t like to be ‘taught’ though we enjoy ‘learning’. Bindu, that is so true! There’s a huge difference between enjoying learning and being willing to be taught. I think it takes a degree of humility and an absence of egotism to benefit from the lessons that come from others, whether they are teachers or not. I think the best students are a combination of self-taught and educator-taught. And you are right that sometimes, we don’t appreciate our school teachers as much as we should until years of experience and maturity help us to see how much we owe them. The best teachers feel the same way you do; they are not in it for the money or the summer breaks. They are in it because they love to see that spark when the students catch the excitement of learning something new.